I have been waiting for this book for a long time, and while it isn’t perfect, it doesn’t disappoint. The so-called “fine-tuning”note 1 of the universe has been the subject of much scientific investigation and philosophical thought since it became apparent less than 50 years ago. 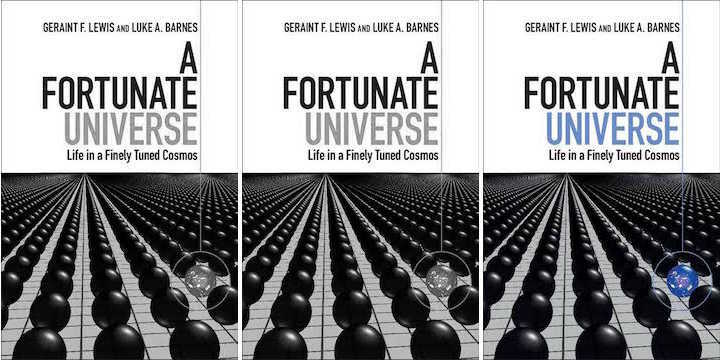 Aussie cosmologist Luke Barnes has written and talked about fine-tuning more than most in recent years, so I was excited to see he had put it all together in book form. However they divided up the workload, the result is enjoyable and informative to read, with lots of quiet humour, references for further reading and a comprehensive treatment of the science. I guess I expected a treatise on the science of fine-tuning, the cosmological facts that couldn’t have varied much without destroying the universe as we know it and making life impossible, much less intelligent life that could become observers as the human race has done. You get that, but much more besides. One of the features of the book is how the science is explained broadly first, and then the fine-tuning examples are built on that foundation. This has the advantage of giving the reader a broad basis in particle physics and cosmology, but means some of the concepts can’t be explained as well as I would like because (I presume) they thought that would make the book too long. The book starts with a slightly artificial and light-hearted dialogue between the two authors, to give an easy introduction to the topic, and to tricky questions like “What is life?”, and how science is built on the work of those who perform experiments and those who build theory on the observations, and test their theories with new observations. So they start with human beings, presumably because we are the observers that are one result of fine-tuning. They drill down from cells to molecules to atoms, finally reaching the fundamental particles of the standard model of particle physics – 6 varieties of quarks and leptons and their antiparticles. I hadn’t understood before how protons and neutrons were composed of different quarks. They show how different masses for the different quarks would lead to different universes, none of them very pretty or interesting. If we allow the possibility of the lighter quarks having masses up to the size of the heaviest quark, the odds of having chemistry suitable for life are about 1 in 10^10 (my estimation from their diagram). Another fine-tuning example is the mass of the famous Higgs boson (not a fundamental building block of the physical universe, but a fluctuation in a quantum field that gives particles mass). Its mass is determined by its intrinsic mass and the effect of quantum fluctuations, but to get the mass observed, the quantum fluctuations must be reduced by some mechanism that is fine-tuned to 1 in 10^16. Have you ever wondered what a force is? What is it that allows gravity or magnetism to attract something distant from it? Well apparently the whole universe is filled with quantum fields which are constantly fluctuating in value and direction at every point. When these fields change in certain ways at certain points, they behave like a particle. And when two particles come close to each other, they may exchange a photon or a gluon (which aren’t fundamental particles but exchange particles or gauge bosons) and the particles change direction and velocity. Thus the four fundamental forces are “carried” by the gauge bosons; gravity by gravitrons (this isn’t yet certain), electromagnetism by photons, the strong nuclear force by gluons and the weak nuclear force by three particles labelled Zo, W+ and W–. The strength of each force is determined by the respective coupling constants. And it turns out that the relative sizes of the constants is an area of fine-tuning, because they control how chemistry and radiation work. For example, the electromagnetic (measured by the fine structure constant) and strong forces are fine-tuned to an incredible degree, with all but a very small range of possible values of the two coupling constant resulting in unstable particles. There are similar catastrophic results if the relative values of other forces are varied. Life, and almost everything else, needs energy; in fact, it needs useful energy, which means energy differences. Heat will flow from a hot (high energy) object to a cold (low energy) one, but won’t flow if the two objects have the same temperature. The universe began with an enormous amount of concentrated energy, and it is the high energy in the sun which supports life on earth. But everything that happens tends to reduce the energy differences in the universe, and so the universe is moving towards a state of homogeneous energy, at which time nothing more can happen – in popular terms, it is “running down”. The term entropy more or less measures the amount of useful energy that has been used up – so the universe started in a low entropy state and entropy increases all the time. A characteristic of carbon atoms known as the Hoyle resonance (too complicated to explain here) allows more complex elements to be formed in stars and spread out into the universe by the explosion of supernova. Without this resonance, which is finely tuned to about 1 part in 10^23, there would only be hydrogen, helium and beryllium atoms, no carbon or oxygen or iron, which doesn’t allow a complex universe to form. If our universe had started in a high entropy state (i.e. much less useful energy), much of its matter would be locked away in black holes, it wouldn’t last as long and couldn’t support much activity. But it turns out it started in a very low entropy state, which was against impossibly long odds of 1 in 10^10^123, a number too large to even imagine. Our sun is one of about 300 billion stars in the Milky Way galaxy, which is about 100,000 light years across. Our galaxy also contains planets, gas clouds and dark matter, which permeates the entire universe, even the room you sleep in. Our galaxy is one of about a hundred, mostly smaller, galaxies known as the local group. Beyond that, there are billions of galaxies spreading out in all directions as far as telescopes can see. Most galaxies seems to be clustered in strings and groups forming a web-like structure. Our universe looks amazingly complex, yet it can be described using about 10 equations. To do this, cosmologists have made the simplifying assumption that on cosmological scales, the universe is homogeneous (the same everywhere) and isotropic ( (it looks the same in every direction). The interesting thing is that a century of astronomical observations has only strengthened these assumptions. Our universe is expanding. Cosmologists calculating the interplay of the fundamental forces and matter came to the conclusion that this expansion should be decelerating, but it’s not. The only explanation they can come up with is that the universe is permeated with dark energy, which speeds the expansion. They calculate that the matter we see makes up only 5% of the universe – dark matter (26%) and dark energy (69%), neither of which are understood, make up the rest. The authors describe the evolution of the universe from big bang until now, and all the processes that were required for galaxies, stars and planets to form. So will it one day cease to expand and collapse back in on itself, or will it expand forever? It turns out it is right on the line between expansion and collapse., fine-tuned to 1 in 10^55. Without this fine-tuning the universe would have either collapsed too quickly or expanded too fast for stars to form. The universe is composed of quantum fields. If a field behaves in a certain way, it appears as a particle, but other fields remain as quantum vacuums, each with its own positive or negative vacuum energy. It turns out that to arrive at the structure we see in the universe requires the positive and negative vacuum energy to be fine-tuned to 1 in 10^120. Other examples of fine-tuning on the universal scale include the density of the universe and the mass of the neutrino. The remaining chapters of the book get into some speculative territory. Chapter 6 discusses more “way out” possibilities, like Schrodinger’s cat, quantum entanglement, making more radical changes to the laws of physics (such as the number of dimensions), symmetries, and the nature of time. Then they examine a dozen objections to the idea of fine-tuning or misunderstandings of it – most of them statements I have heard in discussion on the internet. The possibility that we are living in a computer simulation. If you’re interested in fine-tuning, this must be the go-to book – it is readable, full of quiet humour, authoritative and comprehensive. It gives good recommendations for further reading. But be prepared for your mind to be challenged! My only criticism is that it isn’t long enough. At several points I would have liked slightly more explanation, especially the parts addressing quantum physics and Boltzmann brains. How do particle physicists know the things they tell us? How can the whole universe be composed of quantum fields, only some of which look like solid particles? How does the movement of a photon or gluon transmit force? Are the things they say about quantum particles (like spin, charm and strangeness) really true or just mathematical ways to describe a model? But these are minor criticisms. I don’t doubt that if they answered all my questions, that would only raise new ones. They had to stop somewhere. Our universe is an amazing, unexpected place, from its fundamental particles right up to its cosmic structure. It must be so satisfying to spend one’s life exploring all this. And we can share in some of that through books like this. I’ll now be looking to update my pages on fine tuning. Note 1. There are two ways to use the term “fine-tuning”. As scientists use it, it doesn’t infer a designer who fine-tuned the universe like a car mechanic tunes a racing car, but describes the fact that small changes to many fundamental equations and constants in cosmology would make the universe unlivable and probably either featureless or short lived. But this scientific fact of fine-tuning then leads to a philosophical “fine-tuning” argument that there is indeed a designer. For most of this post, I use the term in the scientific sense. « Update: Did Josephus write about Jesus?